Aluminium catering foil, ideal for all kitchen areas. Available in width size, 12 inch or 18 inch. Ideal for catering purposes, this product is commonly used in food preparation, wrapping and preserving food. This catering cling film comes in its own dispenser box with an easy to use cutting edge. Available width size 12 inch and 18 inch. Product code: CLI002 - 12 inch , CLI003- 18 inch. Q. Is this cling film perforated or does the box include a cutter? A. This cling film isn't perforated but the box has a plastic cutter. Q. 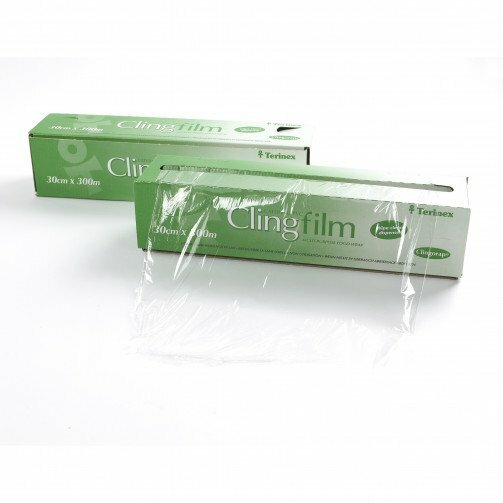 Is this cling film suitable for use in an oven for cooking purposes? A. We wouldn't recommend using this cling film for such purposes, but it is safe to use in microwaves.